The tweet above says it all. 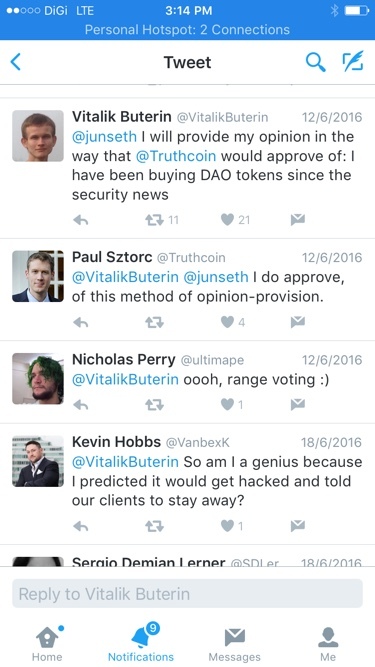 Vitalik was actively trading DAO tokens. After the DAO launched, and traded in the secondary market at a discount, Vitalik bought even more. How many did he hold once the “hack” happened? Did he buy more DAO after the hack, as it traded at an even larger discount to par? We don’t know the answers to these questions. Was Vitalik’s decision to support and help orchestrate the hard fork clouded by his holdings of DAO tokens? Very likely. How many other Foundation members owned DAO tokens prior to when the decision was made to bail it out via a hard-fork? Where there is smoke there is fire. Vitalik surely isn’t the only Gordon Gekko at the Foundation. I am not passing moral judgment on the trading activities of the Foundation. However, I do find it hypocritical for traders who claim to love “decentralisation” and financial freedom crying out for some government agency to investigate the trading practices of the Foundation. Is the Foundation slimy, maybe. But I prefer the cowboy digital currency trading space, to blatantly central bank manipulated traditional asset markets.